We are building up to our annual fundraiser on the 22nd September. It has been a busy few weeks getting everything ready but now we are just looking forward to the big day and seeing everyone. We depend on the fundraisers to maintain the holiday homes and Emmanuel House. In 2006 we purchased three holiday homes at Cragside caravan park in Weardale. These we kitted out especially so cancer patients, the terminally ill and their families can go for respite care, completely free of charge. We’ve had many people stay after being referred by Macmillan nurses over the years. Unfortunately for some it is the last holiday they spend together but at least they have wonderful memories to cherish and look back on! This is run alongside Emmanuel House, Gateshead’s free holistic therapy and drop in centre. A place for anyone to drop in and talk, share and relax. We always have a great laugh at our fundraisers and this time is no exception! We have Miss Hollywood booked to keep us entertained. She has been at many of our do’s and is a fabulous act to see. We have prize raffles, bingo and much more! So why not give us a ring and get your tickets too? 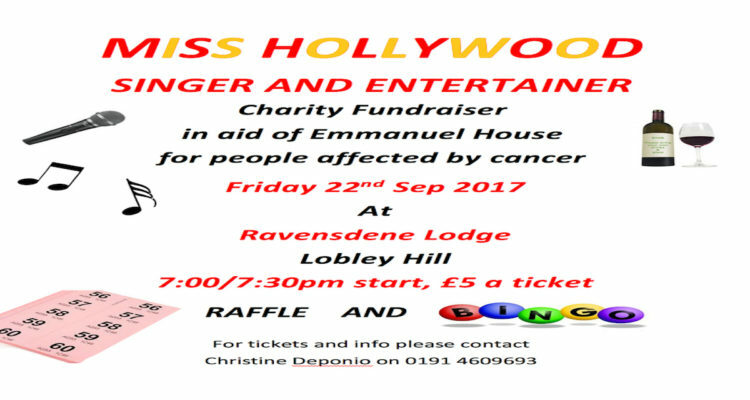 Our event is held at Ravensdale Lodge in Lobley Hill on Friday 22nd September 2017. Doors open at 7.00pm. They must be purchased in advance from myself. Ring us on 0191 4609693. Look forward to seeing you all. Read about Christine Deponio's remarkable life in part 1 of her autobiography. Available now as paperback or ebook. Learn more or See the Five star reviews on Amazon! We accept referrals through your GP or Macmillan nurse, or you can just drop in. © 2019 Emmanuel House. Website by Consilience.